The Goal Zero Yeti 1400 Lithium is the next generation of portable, award-winning power. Engineered from the ground up, the Goal Zero Yeti Lithium is the one of the most versatile and innovative power stations on the market. Its built-in surge allowances and multi-stage protection means great compatibility with more devices ranging from lights to laptops, refrigerators to power tools, giving you the confidence to power anything, anywhere. 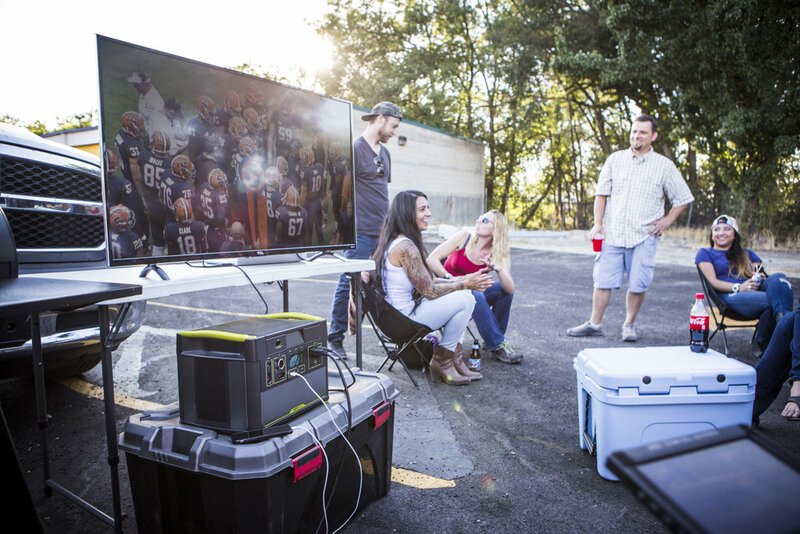 From USB to AC, the Goal Zero Yeti 1400 Lithium features the outputs you need to get the job done both indoors and out. The multi-stage surge capability of the AC inverter sets a new industry standard for portable power and allows you to power more devices than ever before – power tools, water boilers, refrigerators, and more. Get real-time usage data at a quick glance. The upgraded display features a runtime/recharge time estimator, as well as an output and input meter. Winner of the prestigious Innovation Award from the Consumer Electronics Association. Keep your Goal Zero Yeti 1400 Lithium powered up from the wall or from the sun (solar panels sold separately). The Goal Zero Yeti 1400 Lithium can be charged by connecting a compatible solar panel. If you are a standard or light user and use about 30-40% of the power per day we recommend 1 Boulder 100 Solar Panel. If you are a heavy user using all the power in one day, we recommend using multiple Boulder 100 Solar Panels to recharge. The Goal Zero Yeti 1400 Lithium can be recharged from a regular wall outlet in about 25 hours. You can charge your Yeti with solar panels, and a wall charger at the same time. Add Panels to your Yeti.